Oh God, they're going to play the Colle. It's going to be dull and I'm not going to know what I do and they're going to put a knight on e5 and I'm going to lose. I'm going to put my bishop on d7 but they won't take it so it'll just get in the way. I won't castle for fear of a kingside pawn attack but then I'll end up having to castle anyway and the kingside pawns will do for me before move 25. Calm yourself, grasshopper. Seeing as we know what they're going to do, let's not let them do it, shall we? 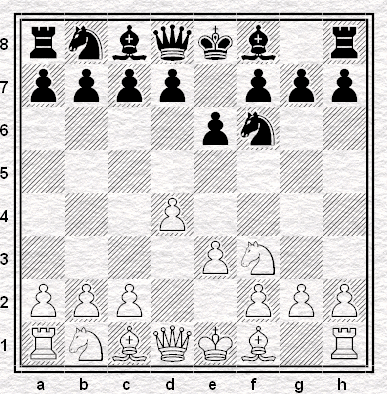 Let's find ourselves an anti-Colle system where there's no hole on e5 because we leave the d-pawn where it is. Let's put the c8-bishop somewhere else. And just in case they've looked into systems like that, let's play it a little differently so that we know what we're doing, and they don't. But how, oh Streatham and Brixton Openings Guru? Will you teach us? Of course I will, for I am a qualified librarian and the sharing of knowledge is my vocation. I have an idea I worked on, briefly, a few years ago. It came to mind again when I was reviewing John Cox's Dealing With d4 Deviations (Everyman, 2005) for Kingpin. It's a decent book: I am currently using it in a correspondence game (a good test for a guide to theory) in which I am facing the Trompovsky. However, for our purposes we are more interested, right now, in a line Cox gives against the Colle. It's a line which I quite like ,which I've seen before and which, as I desire, keeps the d-pawn at home for a while. As Cox notes in his bibliography, it's a line which Gary Lane discussed in his Ultimate Colle (Batsford, 2002) albeit Cox's view of the Black position is more favourable than Lane's. It was when looking through Lane's book some years ago (borrowed, as I recall, from the Camomile Street Library in the City of London) that I came up with an idea which may be good, bad or indifferent, but as it threatens to gain a full tempo on a theoretical line, must surely be worth investigation. Black has the two bishops, but is uncastled and slightly behind in development. 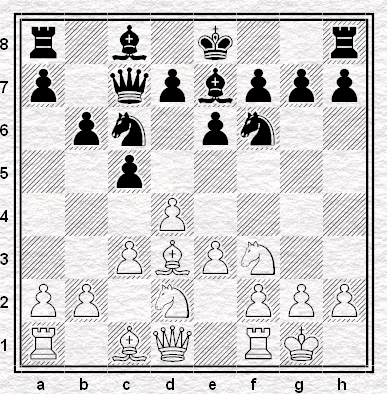 Lane likes White, Cox thinks Black is fine: possible continuations are 13.Ne5 and 13.d6. When actually playing through the line in the first place, though, something struck me as odd - the c8-bishop moves twice. 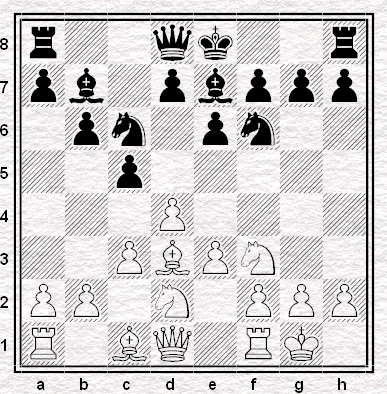 Is there not some way to try and improve on that so that it goes to a6 in one move? Does it need to go to b7 first? I'm not convinced that it does and certainly I'd be interested to be shown otherwise. As it stands, I have a preferred order of moves which I came up when trying to improve on Lane, and I'd like to take a closer look at it, once or twice in the forthcoming week. We'll see what it might offer over and above the line we've briefly seen - and then we'll maybe ask ourselves what might be the potential drawbacks, because it is not a forcing line and there may be nuances of move-order which give White opportunities that the ...Bb7 line does not. The bishop is still at home: if we contine 8.e4 cxd4 9.cxd4 Nb4 10.Bb1 Ba6 then Black will have an extra move, the queen getting to c7, compared to the line above. Are we really getting that for free? I'm not sure, but I am sure the question is worth the asking. We'll be asking it this week. A quick database search showed 5 previous games with your idea. None continued with e4. Instead 8 Re1, 8 Qe2 and 8 a3 have been tried. Looks like a decent try against Colle players running on automatic - personally I think 2 .. g6 is best if you know the Colle is going to be punted. Well yes, provided you don't mind playing the King's Indian if they change their mind. 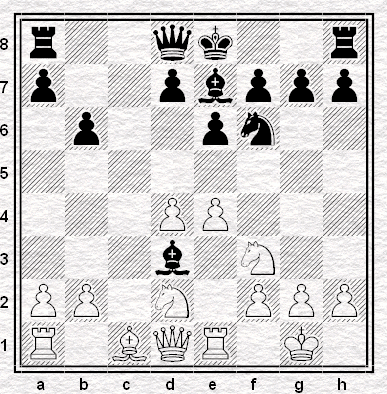 Not at all dangerous for Black, that and dealt with by Cox on pages 83-4. 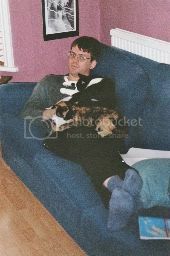 If I recall correctly, Andrew Thake once put a joke motion to an S&BCC AGM banning the members from playing the Colle. I forget whether the motion was passed but one Colle-loving member was afronted and left the club! I always feel pleased to see the Colle or any of the "Boring Systems" - I figure I won't lose before move 25!